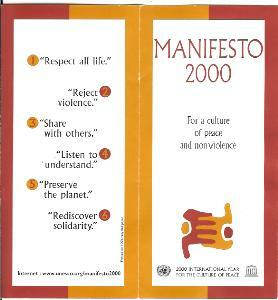 Leaflet for Manifesto 2000 - click here to see or download entire leaflet. Financing of the publicity campaign was provided by the Director-General from existing UNESCO funds, including from sector programme budgets. This was done by the Director General for a number of his priorities at that time, and it was a source of frustration to some our colleagues and to certain of the Member States. New extra-budgetary funding for the campaign was not obtained despite some efforts, including an application to the Turner Fund for $3 million that I made despite bureaucratic opposition within UNESCO. 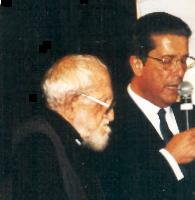 The formal launch of the International Year, which took place on September 14, 1999, was marked by publicity in at least 87 countries, as documented in Annex VII. No doubt, the campaign was even greater in scope, however, as this was simply the information that we received at UNESCO headquarters.